Former Renault-Nissan Chief Carlos Ghosn said his arrest and detention is due to "plot and treason." “Plot and treason get the blame” for the arrest of Nissan’s former chairman Carlos Ghosn, the 64-year-old executive said during his first public comments since being dragged off his corporate jet on Nov. 19. Ghosn has been held in solitary confinement ever since and looked gaunt during a court hearing earlier this month. Japanese prosecutors have successfully argued against bail for the exec, even though co-defendant Greg Kelly was released on Christmas Day. 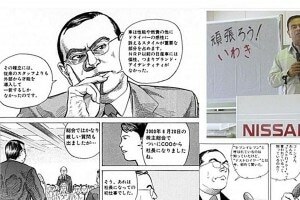 Until now, Ghosn has only been allowed to meet with his lawyers, embassy officials and prosecutors who were interrogating him daily and trying to get him to sign a confession written in Japanese, a language Ghosn does not speak. The case has generated worldwide interest – and plenty of skepticism. As TheDetroitBureau.com has reported, outside observers, as well as some corporate sources, have questioned whether the case is actually something of a palace coup. Nissan CEO Hiroto Saikawa has done little to hide his apparent desire to change the nature of the relationship between the second-largest Japanese automaker and its French partner Renault – something expected to be on the agenda when Saikawa and his Renault counterpart meet in Europe this week. 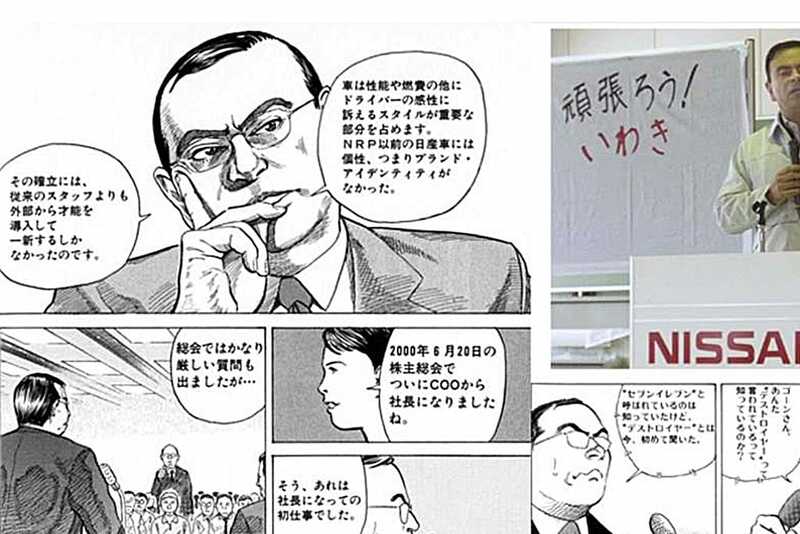 Carlos Ghosn was once so revered that a comic book was created about him in Japan. During a 20-minute interview with Japanese newspaper, the Nikkei, Ghosn did little to abuse observers of that perception. 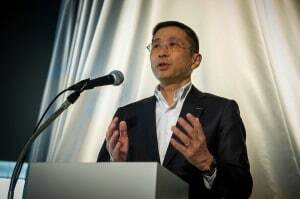 In a news conference after Ghosn’s arrest, CEO Saikawa emphasized his belief that Ghosn had become “too powerful” in his multiple roles as CEO of the Renault-Nissan-Mitsubishi Alliance, chief executive of Renault and chairman of both Nissan and Mitsubishi. What’s unquestionable is that it came as a massive come-down for a high-flying executive once so popular in Japan he became the star of a comic book series. It focused on Ghosn’s role as the front man for Renault’s $6 billion bailout of the then-floundering Nissan. He subsequently became the Japanese automaker’s CEO. Ghosn helped put together what was initially the Renault-Nissan Alliance. Mitsubishi came on as the third leg of the partnership two years ago when Nissan took a controlling stake in the smaller Japanese manufacturer. But Nissan claims that Ghosn abused his authority in a variety of ways uncovered by a months-long investigation triggered by what it has described as a “whistleblower.” So far, prosecutors have accused Ghosn of concealing $88 million in income and other financial irregularities, with other charges possible. Kelly, who was arrested at the same time as Ghosn, was charged with assisting Ghosn in the scheme. Nissan, meanwhile, now faces charges, as well. Nissan CEO Hiroto Saikawa said he felt that Ghosn held too much power over Nissan due to his role in the Alliance. Saikawa, a one-time Ghosn protégé, has taken hits from those who question the handling of the case. That includes another former Ghosn associate, Jose Munoz, who quit two weeks ago after being pushed into overseeing an ongoing probe of internal corruption at Nissan. “Unfortunately, Nissan is currently involved in matters that have and will continue to divert its focus,” Munoz wrote on his Linked-In page following his decision to leave the automaker. 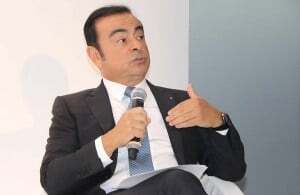 Nissan has dismissed such criticism, as well as Ghosn’s repeated claims of innocence. “The sole cause of this chain of events is the misconduct led by Ghosn and Kelly,” company spokesman Nicholas Maxfield told the Associated Press in response to the former chairman’s interview. There could be significantly more downs than ups in the near future if Ghosn continues to lose his bid for bail. According to Japanese reports, it could be six months or more before his trial and, if he loses there he could face 10 years or more in prison. This entry was posted on Wednesday, January 30th, 2019 at and is filed under Asia Pacific, Automakers, Automobiles, Europe, Executives, Lawsuits/Legal, Markets, Mitsubishi, Nissan, Personalities, Politicians, Renault. You can follow any responses to this entry through the RSS 2.0 feed. Both comments and pings are currently closed.